These tikka kebabs are so easy to make and super delicious... prepare to be the envy of every barbecue! If you have time then marinate the tofu in the soya sauce for two hours, otherwise skip this direction and go straight to stage three. Lightly fry the tofu in the soya sauce until the liquid has been absorbed but the tofu stays soft rather than crispy. Remove the tofu from the heat and leave it to cool. In a large bowl thoroughly mix together the yoghurt, tikka paste, gram flour, salt, pepper and optional lemon juice and vegan syrup. Stir the tofu into the yoghurt mix, making sure it's thoroughly coated and then place in the fridge for one hour. Cut the green pepper into bite size chunks. 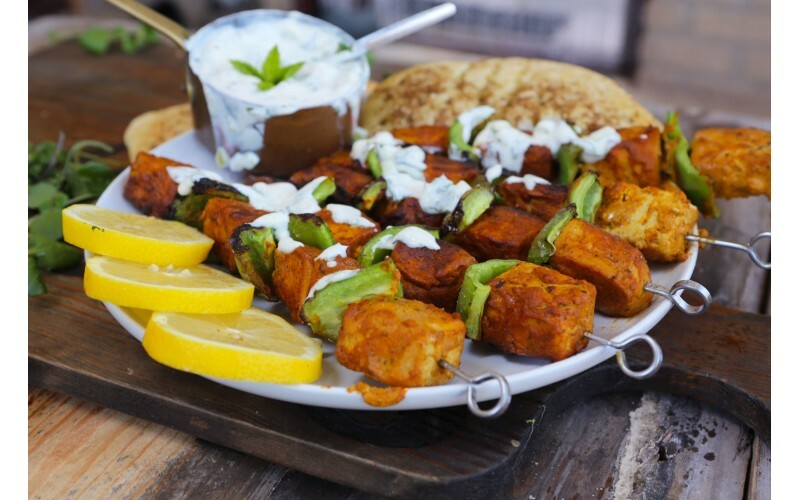 When the barbecue (or hot grill) is ready, thread the tofu onto skewers alternating with a chunk of the green pepper. Cook on both sides until lightly charred. Serve with raita, salad and vegan naan or flat bread.